A recent paper in Reviews of Geophysics describes how water vapor isotopic measurements and modeling can improve our understanding of the Earth’s water cycle. 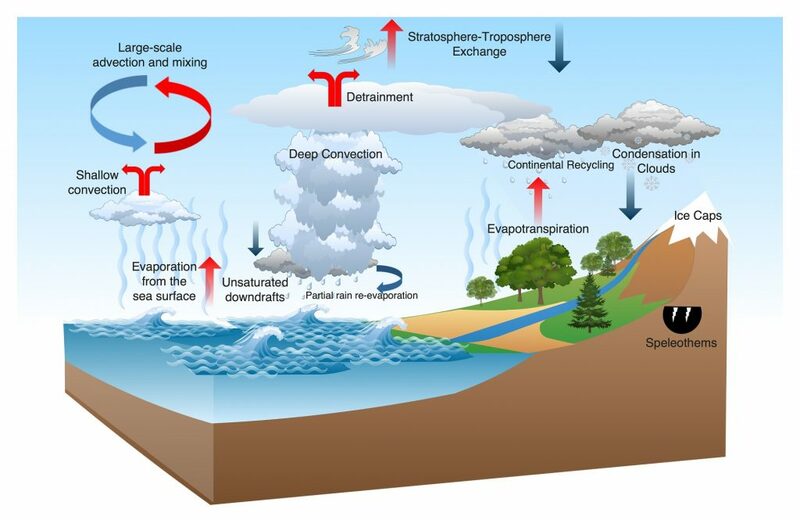 The atmosphere is a major part of the water cycle. There is much untapped potential in the use of water vapor isotopic measurements and modeling to learn about current processes in the atmosphere, as well as assessing past atmospheric circulation patterns and storm paths. A recent review article published in Reviews of Geophysics discussed methodological developments in this area. The editors asked one of the authors some questions about how this technique improves our understanding and where further research efforts are still needed. What is the “isotopic composition” of water and why is it important? More than 99% of the water on Earth is the familiar H2O. The remaining 1% is made up of stable isotopologues, which are water molecules with at least one stable isotope of oxygen or hydrogen. A stable isotope of an atom has a different number of neutrons, and when that atom is incorporated into a molecule like water, we refer to that molecule as an isotopologue. About 0.2% of the water on Earth is made of H218O instead of the usual H216O. An even smaller amount—about 0.04% of the water on Earth—has a stable isotope of hydrogen called deuterium in place of one of the hydrogen atoms. For decades, scientists have known that the amounts of these different water isotopologues can tell us a lot about the Earth’s hydrologic cycle. The relative amount of H2O, HDO, and H218O in a sample of precipitation or water vapor is called its isotopic composition. How is the isotopic composition of precipitation or water vapor measured? Scientists have long been able to measure the isotopic composition of precipitation using mass spectrometers, but measuring the isotopic composition of water vapor with a mass spectrometer is a little more complicated. This technique requires cryogenically freezing water vapor from the air and then passing that sample through a mass spectrometer. It is a time-consuming process that limits the number of analyses that are practical to obtain. However, new techniques have been developed over the last 20 years that use lasers to quickly and accurately measure the isotopic composition of gases, including water vapor. With these instruments, scientists can obtain continuous measurements of the isotopic composition of water vapor every few seconds, year after year. Around the same time, scientists developed new techniques to measure the isotopic composition of atmospheric water vapor from space using satellites. The satellites help scientists to make maps showing the isotopic composition of water vapor worldwide. Concurrently with these advances in measurement, scientists have also developed sophisticated computer models of weather and climate that can simulate the isotopic composition of water vapor and precipitation. Taken together, these recent developments in the measurement and simulation of water vapor isotopic composition have opened up a whole new field of inquiry into Earth’s hydrologic cycle. How can this improve our understanding of atmospheric processes today? The processes that form clouds and precipitation, and the processes that govern the evaporation of water from the land or ocean surface, leave a distinctive “fingerprint” on the water vapor that remains in the atmosphere, and we can use that signal to constrain these processes in ways that were nearly impossible to do before. Recent studies have used analysis of water vapor isotopic composition to better understand the atmospheric branch of the hydrologic cycle over the oceans, over ice sheets, and in the highest parts of the atmosphere. We are optimistic that the analysis of water vapor isotopic composition can help reduce some of the uncertainties in projections of future greenhouse warming. How can this improve our understanding of atmospheric patterns in the past? Much of our understanding of past climates has come from analyzing stable isotopes in ancient snow and ice from Greenland, Antarctica, and from tropical glaciers. In order to understand the processes that set the isotopic composition of snow falling in Greenland several thousand years ago, for example, we need to understand the full suite of processes that brought that snow there. This means understanding the history of how water vapor circulated through the atmosphere and the processes that influenced the airmasses as they traveled to Greenland. The study of modern water vapor isotopic composition provides important context for thinking about ancient records, and these can also inform our studies of the computer models that simulate climates of the past. Where are additional measuring or modeling efforts still needed? 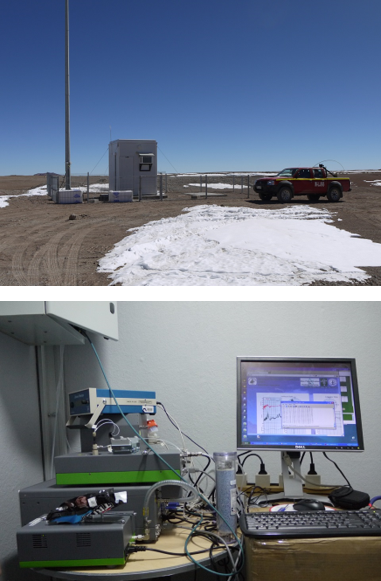 This remote cabin atop the 5 km high Chajnantor Plateau on the edge of the Atacama Desert in the northern Chilean Andes contains a water vapor isotopic analyzer, which has been measuring water vapor isotopic composition nearly continuously since 2012. This subtropical high altitude site is well-suited for studying the processes that govern the very driest parts of the troposphere. Our review identified several unresolved issues where there is scope for further scientific work. First, some of the most significant uncertainties in projections of future greenhouse warming are due to the complex roles that clouds play in Earth’s climate. The processes that control cloud formation are, to a great extent, the same processes that set the isotopic composition of water vapor, so expanded observational campaigns in marine low-cloud settings and in the upper troposphere may ultimately help us to better understand—and hopefully reduce—some of these key uncertainties about future climate change. These measurements will also help us to better understand what climate models are telling us about future changes in cloud formation and their related impacts on climate. Second, there has been a lot of research in polar regions focused on understanding the relationships between the different water isotopologues. This relationship is encapsulated in a parameter called the deuterium excess, and it is unusually high in Arctic water vapor for reasons that remain elusive. We still need to reconcile observational results with modeling results, an effort that will likely require expanded field campaigns and improved modeling capabilities. These studies will feed back into studies of regional climate of polar regions and will help scientists make better predictions about the potential for changes as the climate warms. Finally, while the vast majority of studies of water vapor isotopic composition have focused on HDO and H218O, new technologies are enabling us to measure another isotopologue of water: H217O. These measurements have been made in precipitation for several years, but there have only been a handful of studies of this isotopologue in water vapor. The studies that have been done are exciting and suggest that we may be able to use these measurements to better understand the relative roles of ocean temperatures and humidity in governing evaporation from the oceans, and for improving our understanding of ice formation over Antarctica and Greenland, with important implications for constraining past climate variability in those regions. Because they require very high precision, these measurements will be very difficult to obtain, but many of us think this is a particularly exciting research challenge. Citation: Galewsky, J. (2017), Uncovering the hidden secrets of water vapor, Eos, 98, https://doi.org/10.1029/2018EO075623. Published on 11 July 2017.